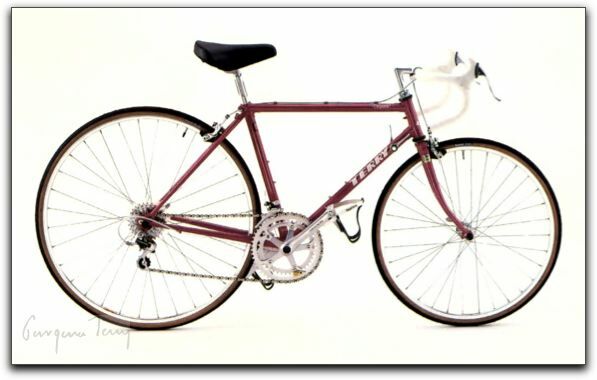 I’m often contacted by the owner of an older Terry bicycle who’s interested in purchasing a new bicycle. Terry bicycle customers are incredibly loyal — they want to continue riding the brand because of its fit and feel, but may be ready for new components and a lighter frame. While I’m always happy to sell a new bike, sometimes it makes sense to refurbish the old one. A good bike shop will know exactly what can be done for your bike, but it’s often tough to get them to spend the time explaining this. While covering every model in detail would take pages, in this article I can at least give you some basic ideas to consider. This is the heart of the bicycle. If it’s structurally damaged (minor dings, nicks and scratches not included), then a new bike is probably the best option. While steel lends itself to repair, the cost often outweighs the value of production frames like Despatch, Prism, Trilogy, Symmetry, Classic and Madeleine, to name a few. This may not be the case for a hand-built frame like Isis Sport, Precision, Isis Pro or Valkyrie. Oh so easy to replace and a wonderful place to get an instant return on your investment. A lighter set of wheels is easier to accelerate than heavier wheels. Every size wheel we use, from 700c to 24″ is available from Velocity USA in Michigan. Their prices are very reasonable and the quality of the wheels they build is excellent. Your dealer can purchase wheels from Velocity or you can order directly from them on their website. If your bike is older, chances are it uses a quill stem (threadless stems are the norm these days). Consider yourself lucky. This style provides you with the ability to fine tune the reach to and the height of the handlebars. Nitto makes a variety of quill stems. If you’re looking for a new handlebar, consider the Nitto “Randonneur” bar. This handlebar is fantastic if you have wrist issues. It allows your hands to rest in a natural position on the bars, stress-free. The bar has a 25.4 mm clamp diameter, which will be compatible with older stems. With a simple shim, it can fit 26.0 mm stems as well. Really early Terry bikes had their shift levers on the down tube. An inexpensive way to move them to the handlebars is to use Shimano bar end shifters. You may need a new rear derailleur for compatibility, but it’s well worth it for the ease of use of bar end shifters. This can get very pricey! The standard these days is 10-speed (the number of cogs on the cassette on the rear wheel) although 9-speed is still mainstream, especially for touring bicycles with their ultra-low gearing. To move up to 10-speed, you’ll need not only the cassette, you’ll also need a rear derailleur, chain, front derailleur and integrated brake/shift levers (unless you use bar end shift levers). You’ll probably also need to change the chainrings on your crankset since front derailleurs are very particular about the number of teeth on the chainrings and the chainring has to be compatible with the rest of the drivetrain. Frankly, you should upgrade the entire crankset to ensure compatibility throughout the drivetrain. As I said at the beginning of this article, this a large subject to cover, but I hope this has given you some food for thought. If you want to discuss the particulars of your bike, you’re welcome to contact me for more information.